Baron Baptiste, famed American Yoga Star, announced a new asana today that he calls the Super Fly. This asana allegedly allows the Yoga practitioner to fly around the Yoga studio. Sources close to Mr. Baptiste explained that this new pose was in reaction to the pose called the Bumblebee discovered by Guru YogaDawg on a banana leaf found in the basement of the Baltimore Public Library and included in his SuperDuperBlissInducer Super Bok Choy Series (See Yoga Lifts Off). The pose has enabled some Yogis to lift off their Yoga mats during Yoga classes. Mr. Baptiste remarked “That Bumblebee pose ain’t nothing. Not only will the Super Fly have the Yogi flying around the studio, but the advanced position will have them walking on the ceiling”. It is rumored that there is a buzzing sound that the Yogi makes at the back of the throat while practicing the pose. The Yoga mat is your most valuable piece of Yoga gear, so as a Yoga student, you must choose wisely which one you will purchase. The Yoga mat will be your Yoga home away from home and even in your home. You might be tempted to use a mat provided by the studio, but YogaDawg advises against this as they are very nasty things, and they tend to be very smelly and disgusting. They really should be lining dog kennels instead of being practiced on. If you do insist on using these because you don't believe anything written in My Third Eye Itches – A Yogic Guide or are too cheap, then be prepared to develop funky skin rashes, warts, boils and lesions on your feet, hands and face. With Yoga mats now available everywhere from trendy coffee shops to upscale bars and saloons as well as in gas stations and even from those guys selling umbrellas and fake watches on the street corner, your selection options can be overwhelming. YogaDawg will describe the mats currently available from the GreatTranscendentalYoga Superstore to make your mat buying experience easy and pleasant. These Yoga mats are all branded with the cool GreatTranscendentalYoga Superstore logo which will instantly establish your credibility as a serious Yogi in any studio, world wide, as you roll it out in your next class. Upon release of the prestigious Yoga eBook My Third Eye Itches - A Yogic Guide award, the non-profit YogaDawg Foundation reports that revenues have soared. 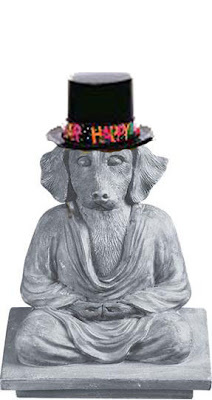 “Dang, we actually sold our first two eBooks on the same day”, commented MadDawg, the huband of HotDawg (formally Born and Maiden America) who are the two disciples of Guru YogaDawg. When asked how much revenue was made, MadDawg replied, “Six dollars and 26 cents ”. MadDawg said that the two YogaDawg eBooks were shipped to the Jivamukti Yoga studio in New York. “We are pretty sure they are for David Life and Sharon Gannon as they had the name of John and Jane Yoga on the shipping label. Obviously proxy buyers for those two.” When asked why the founders of Jivamukti Yoga would want to buy the YogaDawg eBooks (since they have written several Yoga books of their own), MadDawg replied, “Well, it’s pretty obvious that the highfalutin Jivamukti Yoga juggernaut is feeling threatened by the spiritual and advanced nature of the YogaDawg eBook and are assessing the danger they present by examining the real deal.” He added, “It’s like Bill Gates buying up smaller software companies that he deems a threat to his empire”. “Oh”, said this reporter. When asked how the YogaDawg Foundation was going to apply the revenue to further its mission, HotDawg, the lovely wife of MadDawg, replied, “Well, we haven’t decided yet. Let’s just say that for now we have been enjoying a better brand of dog food”. Our bottom-line mat is made from recycled PVC pipes, plastic shopping bags and flotsam and jetsam washed up on the beaches of New Jersey. They are made by imprisoned political dissidents from labor camps in China as well as select sweat shops in Central America and Brooklyn. The Standard Yoga Mat comes in one color only, brown (or slight variation depending on the color of the debris it is made from). Though slightly smelly and which has a tendency to disintegrate when exposed to sweat and leaves mat droppings on the studio floor after each use, you will nonetheless feel like a real yogi as you now own your very own Yoga mat. Note: Some have reported vile reactions in people who may be sensitive to Industrial wastes, carbonvynalflouride and/or chemical and biological hazards. Same as above, only thicker. 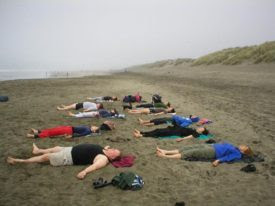 What started out as a rogue Yoga movement, zBest Yoga has taken the Yoga world by storm or as some might say, by yawn. The brain-child of Guru-Z, a former Sheboygan, Wisconsin plumber turned Yoga guru, zBest Yoga is the latest entry in the crowded Yoga scene. Capitalizing on an aspect of Yoga practice that Guru-Z claims is one of the most popular among Yoga students of all strips and disciplines, zBest Yoga consists entirely of laying on a Yoga mat, in a comfortable position, with eyes closed for an entire 90 minute session. Though this new Yoga style might seem a bit ‘light-weight’ to Yoga students that practice a more vigorous style of Yoga such as Ashtanga; students nonetheless have been flocking to zBest Yoga studios in increasing numbers. “We are seeing students who have hurt themselves doing Ashtanga or who have become bored silly with Iynegar”, commented Guru-Z in a recent interview. Guru-Z when on to mentioned that his moment of Enlightenment came when at the end of the class, the students laid on their backs in a final pose known as Savasana. “Well, let me tell you, I had the best snooze ever. My wife told me I embarrassed her because I was snoring up a storm. But I tell you, when she finally kicked me in the head at the end of pose, I felt great. It was then and there that I decided to start zBest Yoga. Like other Yoga classes this one starts off with a chant. While other styles of Yoga might use the sound of Om, a typical class starts with a chant that sounds a lot like snoring. Students are encouraged to be inventive and loud as Guru-Z believed this sets up the next stage in the process known as the 'Great Yawning'. “This is the gateway between earthly existence and transcendental bliss,” the Guru explained. As observed by current students of the method, this yawing is a contagious function that usually goes on for several minutes. The final phase of the zBest Yoga method finds the students on there backs in what appears to be a suspended state of trance. Though an objective observer might claim that the students are really sleeping with all the snoring, drooling and occasional passing of gas, Guru-Z claims that this is Yoga. Just in for the holidays and perfect for the Gen Y and Gen X Yoga student. This mat comes complete with electronic key-chain type bulk class pass, iPod holder, and wireless Internet connection along with complementary gift certificate for the coffee shop of your choice. Included is the world famous Yoga instruction DVD: "You might as well do Yoga since you will never find a job while still living in your parents basement." Made from grass clippings from the lawns of America. They are compressed under pressure. The Natural Dried Grass Yoga SuperMat does not have the normal artificial 'sticky' support, you find on other mats, but rather a more natural grip provides by small sticks and pebbles embedded in the surface. Note: Don't use if you are sensitive to herbicides, pesticides, allergies or doggy-doo.